Back in March of 2016, we presented an exciting initiative by Deloitte, a member of the Big 4 accounting firms, who had launched a news curation about emerging and exponential technologies on Exponentials.xyz. The feed has since grown to become an invaluable resource on the future of tech, but Deloitte didn’t stop there. 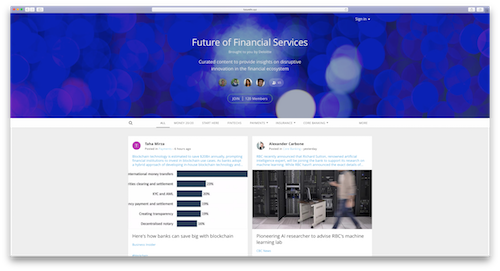 In this week’s #WebsiteWednesday, Deloitte is back with a new cutting-edge curation, this time dealing with the financial services industry – FutureFin.xyz. FutureFin.xyz is Deloitte’s news curation that focuses on disruptive innovations within the financial sector. The site acts as a platform to bring together industry leaders and insiders to post and discuss important news, stories, and content on developments that are affecting the industry. Over 100 members are participating on FutureFin.xyz already and that number continues to grow every day. A popular topic of discussion across the forum is the emerging industry of Financial Technology, or short: FinTech. FinTech is an industry that is undergoing exponential growth and investment in FinTech has continued to increase every year since 2008. Virtual currencies such as BitCoin, technologies like AI (short for Artificial Intelligence), and new payment systems like Apple Pay, Square, Google Wallet, PayPal and others all belong into the FinTech category. With FutureFin.xyz, Deloitte is making it easy to stay up to date on all the latest developments in the financial services industry. Deloitte is building out a portfolio of innovative informative resources for current and future financial thought leaders on the .xyz domain extension. We are proud that Deloitte has chosen .xyz as the home for their news curations and can’t wait to see what they will launch next!